Spring has sprung and it’s time to celebrate! There’s nothing better than enjoying a light snack with a loved one on a gorgeous spring day. 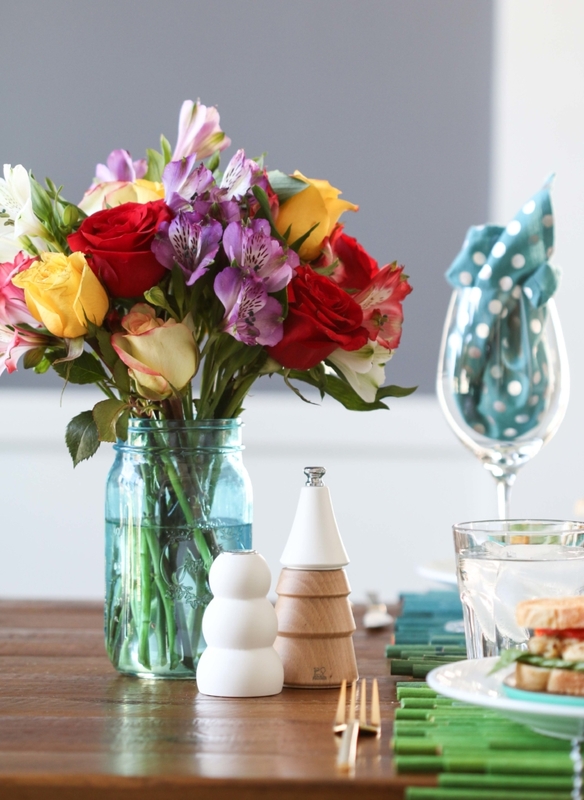 Today I’m sharing a fabulous and colorful luncheon for two. With a few tips, tricks, and one deliciously sweet recipe, you’ll be able to recreate this look effortlessly. Whenever I’m planning a get-together, big or small, I always start with a color scheme. Lately, I’ve been a big fan of combing blue, green, and aqua. There’s something about that combination that feels so fresh and modern. While I try to stick with this scheme for most of the decor, I also tuck in a few unexpected pops of color. Flowers are my go-to for unique splashes of color. This particular arrangement, Smiles & Sunshine, with a rainbow of colorful flowers, was perfect for the table. I also really like the blue mason jar. It has a rustic-meets-modern feel. I carried that look through the rest of my table by including some wood plates, brass candles sticks, modern salt and pepper shakers, and a unique table runner. The food also fits the theme. A rustic salad and grilled chicken sandwich, dressed with your favorite toppings, create a light, but delicious afternoon meal. 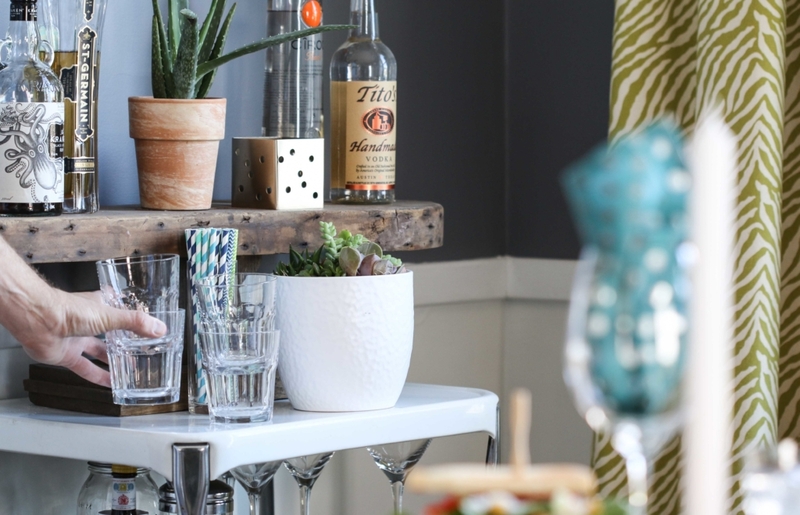 Close by in my dining room is my simple, but hard-working little bar cart. Whether I’m shaking a cocktail, pouring a glass of wine, or mixing a pitcher of lemonade it’s nice to have an area where drinks reside. This way, as the host, if I get busy with the party or event, my guests know where to go to help themselves to another beverage. And don’t forget to decorate this space as well. An easy-to-care for-succulent garden adds life and freshness. And last but not least, let’s talk dessert. For today’s luncheon, I decided to make a Frosted Sugar Cookie Bar. Because honestly, what’s better than a cookie? A whole pan of cookies! 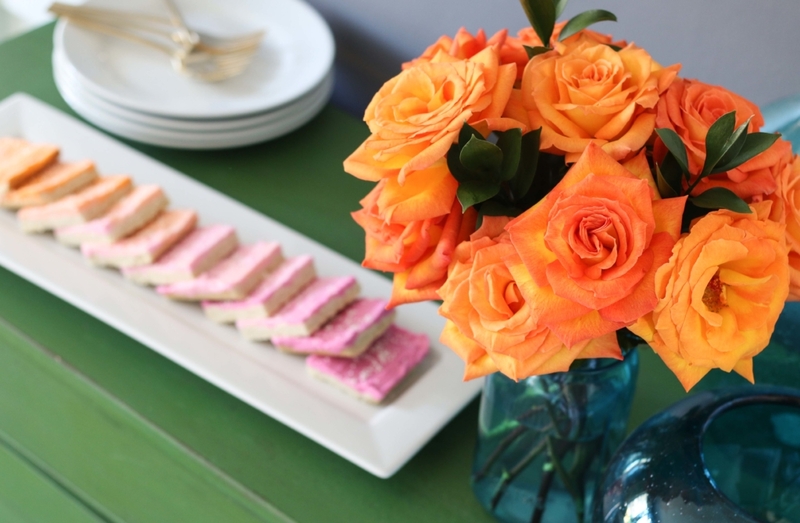 I drew inspiration for the bars from these amazing orange roses. I used four different frosting colors to create a unique and gorgeous ombre effect that mimics the look of the flowers. You can get the recipe for these cookie bars on my blog, Inspired by Charm. And that wraps up my colorful springtime luncheon! What do you think? What fun ideas do you have for hosting the perfect party?